Mabel Kekina of the Hawaiian Trail Mountain Club, shown partially obscured in white at right, talked yesterday to police searching for missing Japanese woman Masumi Watanabe near Puu O Mahuka Heiau. Volunteers from a hiking club, the Honolulu police K-9 unit and officers searched Pupukea yesterday for a missing 21-year-old Japanese woman, but came up empty-handed. Masumi Watanabe, 21, of Japan was last seen near her host family's home in Pupukea on April 12. 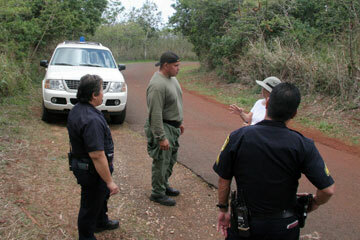 Thomas Yoza and Mabel Kekina of the Hawaiian Trail Mountain Club assisted police with their search in Pupukea. Kekina, 79, who has been involved in searches for missing individuals on Oahu over the years, said they helped police with their search for Watanabe on Saturday, Tuesday and yesterday. Kekina and Yoza combed the grounds at the Boy Scout Camp, the Puu O Mahuka Heiau State Monument and Alapio Road. "We thoroughly searched the heiau. We walked down from the heiau down to the state monument," Kekina said. On Wednesday, police searched parts of Windward Oahu for Watanabe. A neighbor described Watanabe as an "extremely introverted and shy" person. At least three to five times a week, Watanabe routinely walked around her quiet, manicured neighborhood, which has a stellar view of the mountains and the deep-blue waters off the North Shore. During her walks, she spoke little to neighbors. "She didn't make eye contact with other people," said the neighbor, who asked to remain anonymous. She and other neighbors had posted fliers in their neighborhood as well as parts of Oahu that included Chinatown, Waimalu, Kaimuki and Kahala. Area residents also searched the horse trails in Pupukea for Watanabe. The neighbor said Watanabe was expected to return to Japan sometime this week. She has been staying with the host family since February. Watanabe was last seen walking on Pupukea Road near Alapio Road at about 9:20 a.m. April 12. Police had said she was walking toward her host family's home at the 59-600 block of Maulukua Place. Members of Watanabe's host family and her family could not be reached for comment yesterday. Jessica Lani Rich, president and executive director of the Visitor Aloha Society of Hawaii, is assisting Watanabe's parents, who arrived in Hawaii from Japan earlier this week. "They're distressed," Rich said, adding that the family has requested privacy. "We're doing whatever we can to support them," she said. The white Ford F-150 pickup truck that police recently seized as part of their investigation is still in custody. Police declined to release information on the truck driver. While the case is listed as a missing-person investigation, homicide detectives have taken the lead. They have interviewed the truck's owner but have not identified him as a suspect. "Everything is still under investigation," said Sgt. Kim Buffett, of CrimeStoppers.